This Austin Seven Ulster replica was made in 1935. The Austin Seven Ulster was powered by a Supercharged 747cc 25hp straight four engine, this does not seem much power for a car but Ulster's weight was but a fraction of a modern car's. Additional information about the Austin Seven Ulster Graphic: The Austin Seven Ulster was sports version of the Austin Seven produced from 1930 to 1932, only 168 cars were produced. Siteseen Ltd. are the sole copyright holders of this Austin Seven Ulster picture, unless otherwise stated. We only authorise non-commercial picture use and particularly encourage their use for educational purposes. 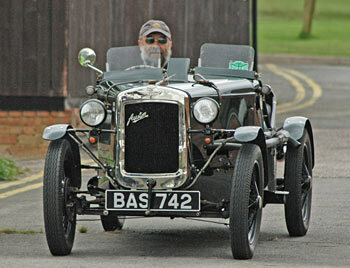 This Austin Seven Ulster Fast Car picture is not in the Public Domain. 1) www.educationalresource.info must be credited as the copyright holders wherever this Austin Seven Ulster fast car picture is used. 3) Use of this Austin Seven Ulster fast car picture, or any of our pictures on websites re-distributing copyright free material is strictly prohibited.